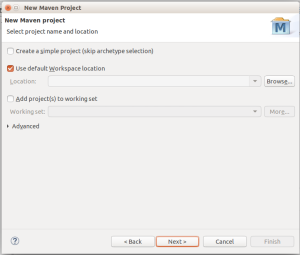 In this post we are going to see how to create a web application using Maven in Eclipse. 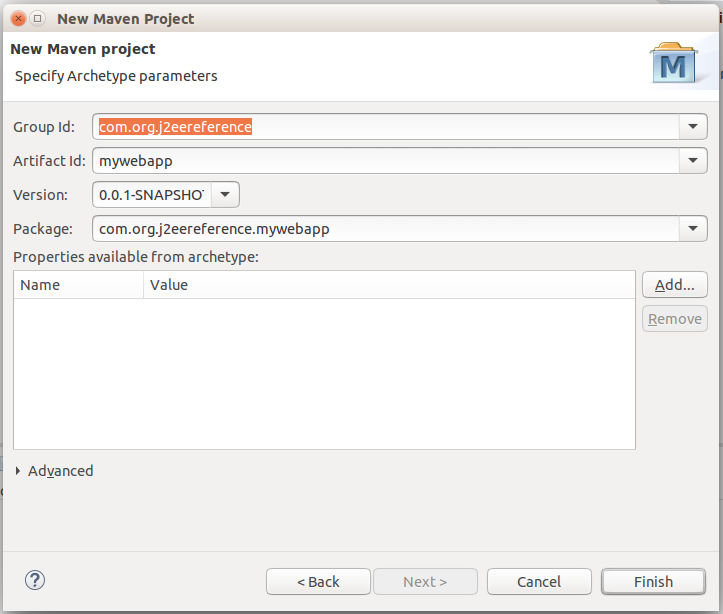 There are many advantages of creating a Web application using Maven. 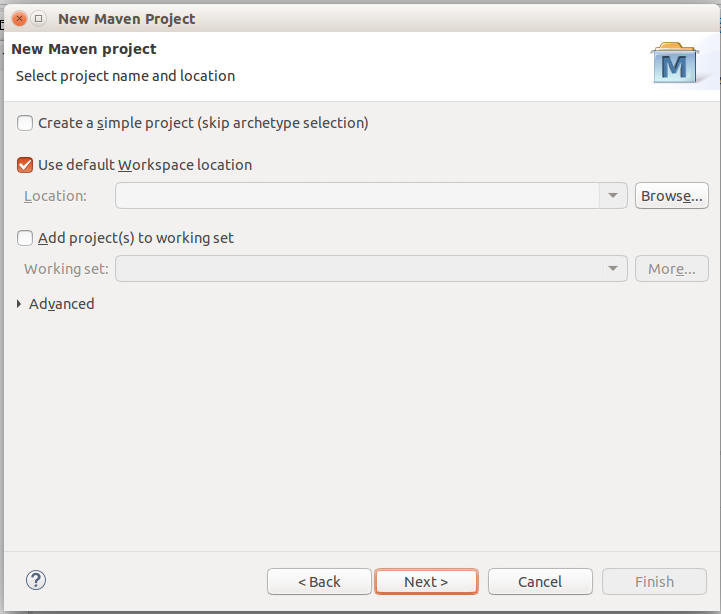 For that we need to have Maven Plug-in integrated into Eclipse. In the next window, we will see options to skip the archetype selection. Leave it unchecked. Select the workspace location and click Next. The next Window will show a list archetypes. We have to choose one archetype based what kind of project we want to build. 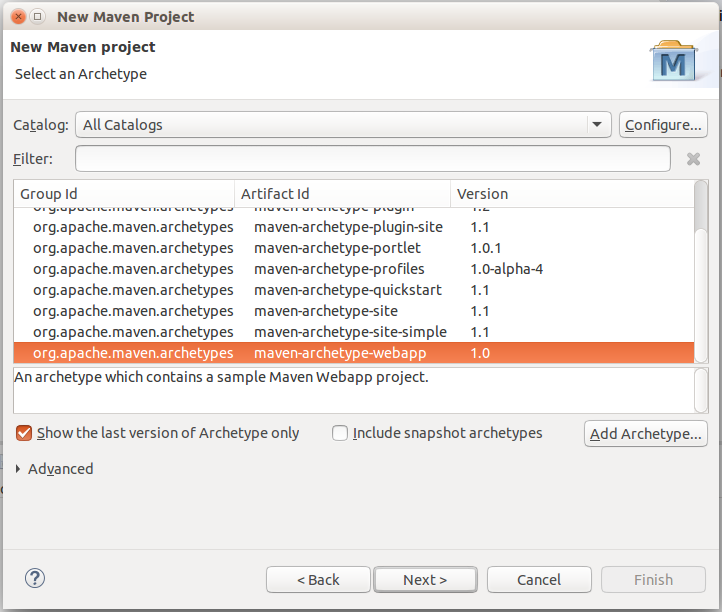 Since we are going to build a web app, we’ll choose maven-archetype-webapp. Click Next. In the next window, enter the GroupId, ArtifactId, Version and Package as required. Click Finish. Note the packaging is ‘war’, because we have selected a web application selected in the archetype. Look at the dependencies. It has dependencies on servlet-api and jsp-api. These dependencies will be used if we are going to use servlet and jsps. We have junit dependency which we will be used to run our test cases. We have <build></build> section at the end which has build plug-ins. There is one plug-in defined that is ‘maven-compiler-plugin’. What to be noted here is that the compiler in Maven is actually a plug-in. What is happening in this plug-in section is, we are configuring how the compiler plug-in should behave. We have <configuration> tag with some values to define it. What happens if we do not use this mention this plug-in in the pom.xml? Maven uses this plug-in by default with default behaviour even if it is not mentioned in the pom.xml. When we run the mvn compile command, it is this maven compiler plug-in that is doing the job. The only reason we would need to mention this in pom.xml is to override the default behaviour of this plug-in and change the configuration. Now all we need to do is export the project as WAR file, drop this .war into a container (tomcat probably) and it should work. Lets look at what will be there inside /src folder. We haven’t written any code yet. If we open /src/main/java/com/org/j2eereference (the package structure), there won’t be any java class by default. But inside /src/main/webapp, we will find WEB-INF folder and index.jsp. WEB-INF will contain the web.xml, which will be pointing the only available jsp that is index.jsp. Deploy this .war int tomcat container and run it. To add a maven dependency, we have to make changes in pom.xml to include that dependency. Maven scans the pom.xml and downloads the required jar for the added dependency. This is our pom.xml in the \src folder. In the pom.xml, notice that the only dependency we have is ‘junit’. In App.java class, we will try to add ‘logging framework’ dependency. We will use the slf4j logging framework to log the test message. If we were mot using Maven, we would download the slf4j jars and add it to the classpath. Only after that we would be able to compile any class file that has dependency for those classes in the jar. With Maven we don’t have to do these steps. Maven automatically does all these steps for us. After adding this dependency in the pom.xml, run mvn compile. What happens now is, before MAven issues the compile command, it scans the pom.xml and finds that new dependency added and downloads slf4j jars from maven repository. Once all the jars are downloaded, Maven includes them in the classpath to makes it available for compile. In the log we can notice that, it connects to the Maven repository and downloads the slf4j jars. This time build has been successful. The /target/classes folder is generated that contains the .class files. In any Application development process, once we are done with the coding, we need to build and deploy the code. We can use Maven for this purpose. Using maven we can build the application with just couple of commands (Ex : mvn compile, mvn package).These simple commands can take care of most of the things. If we have to compare it with Ant, we would have to specify everything that Ant has to do. Ex, if there were ten classes , we would instruct Ant to compile and package all the ten classes, of course using the wild cards to specify the class names. But every step has to be explicitly mentioned. It is not the same with Maven. It has a standard directory structure and it knows what needs to be done. For example, Maven assumes code inside /src/main to be the actual source code and the code inside /src/test to be the test cases. Depending on this, it compiles and packages the code inside /src/main and does not package the /src/test but uses the /src/test to run the test cases before packaging. Every build follows a life cycle – write the code, compile it, test it, package it and install it to an online repository so that it can be used other projects. This is an ideal build life cycle. It is split into different phases. Compile is a build phase, test is a build phase, etc. All these phases together comprise of build life cycle in Maven. If we do not explicitly configure build life cycle, Maven chooses the default life cycle (will be detailed later). For example, as explained above, compile assumes /main to be the default source code directory and /test to be the test cases directory. This is the default behavior of the compile phase has in Maven. Similar default behavior exists for other phases as well. Take for example 3 phases – compile, test and package. In order to do a package, we would ideally first need to do a compile and a test (test need not be necessary, if we want our code to be tested before packaging, we include test phase). The other default behavior Maven has is, once you specify a phase, it automatically executes the previous phases. If we specify package, Maven automatically runs the compile phase and the test phase. validate : checks if everything is in order – configuration, pom.xml, the code. This is usually not called explicitly. Due to the default behavior of automatically calling the previous phases, it gets executed as a previous phase. compile : compiles all the java files into .class files. When we run the compile phase directly, it automatically runs the ‘validate’ phase. test : the phase where we run our test cases specified for the code. Say for example we have MyApp.java as our application class and MyAppTest.java as our test casefor MyApp java class, ‘test’ automatically knows that there is a test case for the code we are trying to compile and runs those test cases after the ‘compile’ phase. So again, if we directly run the ‘test’ phase, Maven automatically runs ‘validate’ and ‘compile’ before the ‘test’. package : packages all the .class files. Again executes all the other phases and packages. Suppose, there is a bug and the ‘test’ phase fails, there is no point in packaging the code. So ‘package’ executes only after ‘validate’, ‘compile’ and ‘test’ are successfully executed. It ends up in a .jar or .war or. ear file depending on what is specified in pom.xml. install : installs the packaged artifact into the local Maven repository. Note that it doesn’t install into the application server. install here is maven-specific. deploy : the final phase often confused due to the name it has. Like ‘install’, it doesn’t deploy the artifact into the application server, we run this phase when we want to publish our artifact to a remote repository where other users can download and consume it for their applications. This is not something we really when we develop applications unless the code we write can be shared on a repository. In order to run any of these phases, we need to run the command – mvn <phaseName> in command prompt from the directory where pom.xml is present. ‘compile’ checks for the projects, it finds that there is a pom.xml in the same directory. Then finds the .java files in the /src directory and compiles. There is only one source file in the example, that is compiled and saved as .class file in /target/classes. Maven pulls up all the test case available in the /test directory and runs them. From the logs we can find that, before executing the ‘test’, it tries to compile the code. Since, the code was already compiled, it says there is nothing to compile and everything is up to date. Similarly, we can package the code using the command- mvn package . This command again, tries to compile and test. On successful compilation and tests, it packages the artifact and places it in /target folder. To install the artifact in the local repository – mvn install . This command runs from ‘validate’ phase all over again and installs the artifact to local repository on the machine. When we run this command, we can notice the logs and see something similar to below statements that confirms the artifact install into the local repository. We can notice that the default location of the local repository, i.e., /m2/repository. The advantage of using Maven is that, it does a lot of things behind the scenes. We don’t have to configure each and every step – creating the source code directories, configuring the dependencies, compiling and packaging etc. 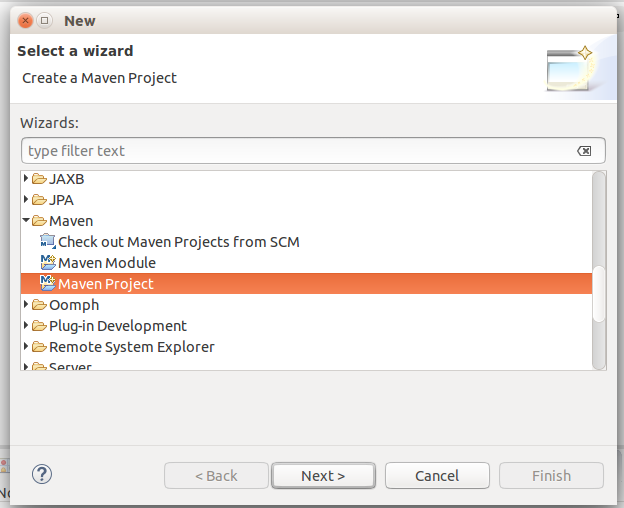 Once we download and configure maven in development environment, we start off with configuring the project structure using maven. From the Project folder in command prompt, we run below command to set up the project. 1. Archetype : This is the information to Maven as to what is the kind of project we need. Maven has a huge list of archetypes. Each archetype corresponds to a particular type of application that we want to develop. It decides the layout of the files, the folder structure and the dependencies that are required. Each archetype is a good starting point for the type of application we want to build. 3. Artifact ID : Identifies the output that project generates. If it is web app, it would be a war file. If it is an enterprise app, it would be an ear file. It is analogous to the name of the jar/war/ear that we want to create. 4. Version : The version of the application. When we are starting the application, we normally keep the default value of 1. With different releases of the application, this version number keeps increment. 5. Package : The name of the package where we need to place our source code. It is an information to maven as to what package a particular class belongs to. Depending the input we provide here, a particular java class will be assigned to the package. We have a sample pom.xml that was generated when we ran ‘mvn archetype:generate’. Notice that we have groupId, artifactId and version in the pom.xml which are the keys for any particular artifact. If we have an artifact and want to publish it to a repository, Maven identifies the artifact using the combination of these 3 keys. We also have a packaging tag which tells Maven what is the actual output – a jar or war or an ear. In the example, it is a jar and this again depends on archetype. If we had chosen archetype for a web application, this would probably be a war. name tag specifies the name of the application. Now have a look at the dependencies tag. <dependencies> will have the list of all the dependencies, each specified inside a <dependency> tag. In the example, there is only one dependency, i.e., junit. To specify the dependency, we again use the combination of groupId, artifactId and version. Say for example, junit releases a new version. The version number would change to, say 3.8.2. The groupId and artifact would remain same and to refer to the newer version, we only need to update the version number. Suppose we want to use a different artifactId for the same groupId, we would change the artifactId to whatever artifactId and update the version as accordingly. So, the structure is like a tree, where groupId is the highest level which has lots of artifacts inside it. We can choose the right artifact by mentioning the artifactId and the version of the artifact. Scope is something that tells when to use the particular artifact (will be detailed in upcoming posts). This is used by Maven when building and packaging the application. 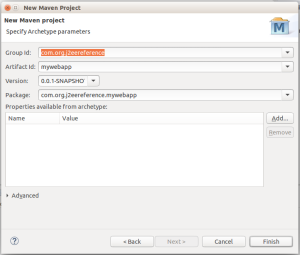 This is how maven uses gruopId, artifactId and version to pull up an artifact from the repository. Now the below code should make sense. Our groupId, artifactId and version number should be in such a way that other applications can consume our artifact if we choose to release this and save it in a repository. This is applicable for other reasons as well. Suppose we do not choose to publish in an online repository but going to use it for internal consumption. For that, Maven has an internal repository on the local machine itself. 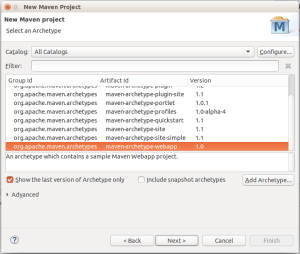 Whenever we build and package any artifact, maven installs the artifact into the local repository. Suppose we have a different web application that uses this jar (MavenTestApp-1.0-SNAPSHOT.jar in the example), all we need to do is, in the pom.xml of that application, we need to add the dependency for this jar. What Maven does is, it will first look in the local repository for this jar and check if such an artifact is available. 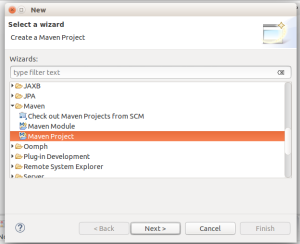 If it available, Maven will pull it up from local repository. If it is not available, it will go to the online repository.